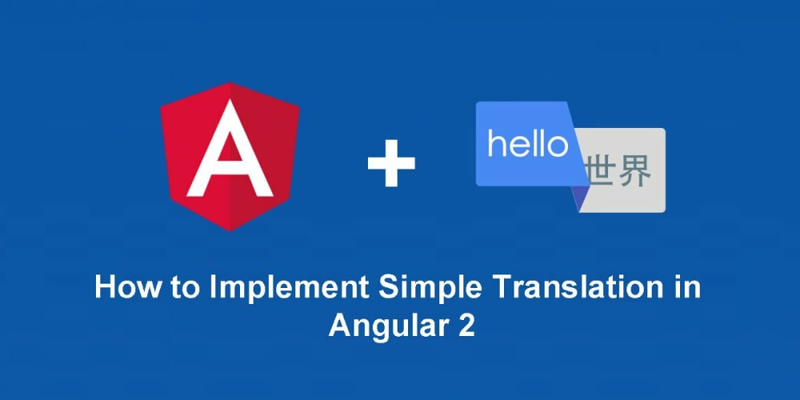 This is part one of a two part series series where we will learn about implementing translation in our Angular 2 application. Ability to define multiple translations (e.g. English, Spanish, Chinese, etc), then set the current language. When a user clicks on the language buttons, translation should be updated accordingly. We created a translate folder under our app folder for all our translate related files. lang-[name].ts files are where we keep our translation definitions. In this example, we have English(en), Spanish(es) & Chinese(zh). translations.ts is where we concat all translations. translate.pipe.ts and translate.service.ts are the files for our service and pipe of course. index.ts is for barrel export. More on this later. Let&apos;s add some translations in our lang-[name] files. Now let&apos;s link all the translation files in our translation.ts file. We imported all the translation definition files. We created an opaque token called translations. An opaque token is an object with no application interfaces. It&apos;s a special kind of provider lookup key for use in dependency injection. For more details, please refer to Angular official document. dictionary variable links all our translations. TRANSLATION_PROVIDERS notes that we use the opaque token that we defined earlier, and supply our dictionary as value. Later we will register TRANSLATION_PROVIDERS during bootstrap (main.ts). Note that we import our TRANSLATIONS token and inject it into our constructor. Let&apos;s now create our translation pipe. Our pipe is simple - no logic in the pipe. We will import and call our translate service to perform the translation. Both the translation service and pipe are now done. Let&apos;s use it in our app component! Before we can use the translation service and pipe, we need to import it to our app module. We register our service and pipe in the application level. We make our translate pipe available globally (application wide). Please refer to this article. Then, we can use them in our component. We have an array supportedLanguages to store all supported languages. By default, we set the language to Spanish. Of course, you can read the user&apos;s browser language navigator.language and set default language accordingly. When a new language is selected, we will refresh our translatedText. (We can do better. We will enhance the way we handle the refresh in part 2). Here is our HTML view. <button *ngFor="let lang of supportedLangs"
We will export our translate modules as barrel. A barrel is a way to rollup exports from several modules into a single convenience module. The barrel itself is a module file that re-exports selected exports of other modules. Refer to Angular official documentation for details. Now let&apos;s bootstrap our application. Let&apos;s run your application. When the application loads, Spanish language is selected, and the translation shows hola mundo as expected. Try to select English now. You should see that the Translate with pipe value is not updated. Angular 2 Pipe is pure by default. Angular executes a pure pipe only when it detects a pure change to the input value. In our case, the input value didn&apos;t change, it&apos;s still Hello world. Therefore, the value is not updated. Let&apos;s make our pipe impure. Angular executes an impure pipe during every component change detection cycle. In our case, when we update the language selection, change will be triggered, and the impure pipe will update accordingly. Please refer to Angular 2 Pipes documentation for details on Pipe. Enable a placeholder for translation. Publish and subscribe to a language change event. Enable default language and fallback language.